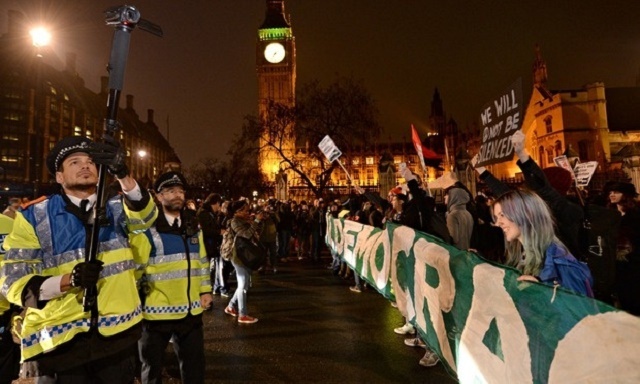 Five years ago, radical activism in the UK appeared to be entering a golden age. Today, it seems to have run out of momentum and ideas. In his latest column, Mikhail Goldman examines the sources of the malaise, and potential ways out of it. Solidarity amongst activists of the left and of anti-systemic movements has been weakened significantly over the past few years for a number of reasons. This article is an attempt to explore some of these reasons in order to feed into ongoing processes of regeneration and reignition of liberatory struggles. Perhaps it’s because I’m of a certain age, but I seem to have the same nostalgic conversations over and over again. Radical activism in the UK, my friends and I agree, is at a low ebb. The last wave (student protests, 2011 riots, Occupy, anti-austerity movement) is well and truly exhausted and has receded with little more than a high watermark left behind. Unlike previous waves of activity we have known, like the anti-roads movement which fed into counter-summit mobilisations, eventually giving birth to the Climate Camp, there is no discernible infrastructure left behind and apparently little energy to begin building again. There seem to me to have been a number of factors at play in extinguishing those fires, factors that are worth analysing before we trudge into battle once again. Firstly, what is meant exactly by ‘waves’ of radical activity? What is being quantified in its ebb and flow? To my mind, we are talking about a level of activity towards a common purpose of throwing off oppression, towards self-determination and self-liberation. The glue that binds the individual acts towards this goal into large-scale movements is solidarity. When many people are able to come together and support one another in their aims, when solidarity is possible, the scale and intensity of struggle are high. Conversely, when there are significant barriers to solidarity, the state and existing power structures can govern unimpeded. Solidarity amongst activists of the left and of anti-systemic movements has been weakened significantly over the past few years for a number of reasons. The remainder of this article is an attempt to explore some of these reasons in order to feed into ongoing processes of regeneration and reignition of liberatory struggles. Many on the left naively believed that the imposition of austerity policies by the incoming Coalition government in 2010 would rally people to their cause. This was not an entirely baseless assumption – the past years have seen an increased mobilisation and coordination of trade union activity as well as the rise of smaller but highly effective grassroots campaigns like Boycott Workfare. However, I would argue that, overall, austerity has had the effect of wearing people down, of creating fears, anxieties and deprivations that have forced many to fight simply to keep their own heads above water. Many of the niches previously available to those fighting for social change, like living on the dole or squatting, are no longer feasible thanks to an increasingly intrusive and punitive system. From the bedroom tax and imposition of workfare to the constant questioning of the disabled and single parents, changes to the welfare system have hit many hard. Meanwhile tightening of budgetary belts at essential services, from women’s refuges to mental health services, has meant that those already suffering are made to suffer again. Those who can keep going find themselves volunteering at food banks and looking after family and friends. The net effect is an entirely intentional grinding down of the majority of the population in order to maintain the dominance of the rich and powerful. In this environment, the ability to take part in broader struggles can seem like an unaffordable luxury. For those who are able to find work, the workplace is increasingly precarious. Whether due to zero-hours contracts, the threat of cuts-related redundancies or the removal of funding, our pay packets are constantly under threat. The precarity of employment, combined with the lack of a safety net if you lose it, makes radical workplace organising a hard sell and the mainstream unions are hamstrung by their attachment to a history and a version of the Labour party that have been obliterated. The current government has learned the lessons of its predecessors and implemented unpopular cuts and increased social control gradually and across many different areas of society at the same time, accompanied by a barrage of scapegoating propaganda in the media. It has been a case of ‘death by a thousand cuts’, rather than a head-on struggle like the Poll Tax, and much harder to resist as a result. Austerity simply seems to make life more anxious for most, and when you are anxious about your daily existence it is hard to sustain anything else. Nevertheless, austerity alone is insufficient to explain the downturn in radical political activity. After all, many of those in the student movement came from relatively privileged positions within society and many long-term activists had erected around themselves an infrastructure of housing co-ops and informal economies that made them relatively protected against cuts. What has to be taken into consideration is the ferocity of state repression that was brought to bear on the movements that had challenged the status quo. Those who were found to have committed public order offences during the riots of 2011, and to a lesser extent, the student and anti-cuts protests, were sentenced extremely heavily. One year after the riots, the BBC reported that those involved had been sentenced to over 1,800 years in prison. To take just one example, the 3 ‘ringleaders’ of a group involved in an attack on a police station in Nottingham were sentenced to 14, 12 and 10 years in prison. For context, compare these to sentences handed out following the 2001 Bradford riot, when 4 years was considered excessive. In 2011, two men were sentenced to 4 years in prison for simply calling for a riot on Facebook, despite the fact that no one turned up. In the aftermath of the student protests, whilst the sentencing was generally less severe, the threshold for what could be prosecuted seemed to be very low indeed. James Heslip received a 12 month custodial sentence for “pushing a sofa toward a window” and Francis Fernie received 12 months for throwing two balsa wood sticks at fully armoured riot police. But it wasn’t just sentencing that was ramped up over this period. Police used both ‘hot’ and ‘cold’ methods to suppress dissent on the streets and make protest an increasingly risky and unattractive prospect. Baton charges, horse charges and the use of dogs have long been in their arsenal but they were unleashed with ferocity to quell unrest over this period. If a protester wasn’t clubbed or crushed then the likelihood was that they would end up in one of the Met’s infamous kettles and kept on the freezing streets for up to 7 hours without access to water, food or toilets(6). Those caught in a kettle could then be subject to mass arrest, such as in the infamous UK Uncut Fortnum & Mason case and held under threat of prosecution for months and even years whilst under restrictive bail conditions. Another crackdown that has definitely affected the feasibility and effectiveness of direct action in the capital was the banning of squatting in residential buildings. It is an open secret that, at the time of the student and anti-cuts protests, a lively squatting scene underpinned some of the more radical actions. Certainly, squats were used as bases for direct action and allowed a network of people opposed to the system to exist in ‘the belly of the beast’ whilst remaining relatively off the radar. New legislation makes the squatting lifestyle considerably more difficult and waves of evictions have weeded out many of the fiercer collectives that resisted. It’s also necessary to take into account the uncovering of historic police spies who had infiltrated protest movements. After the outing of Mark Kennedy as a police spy in late 2010, revelations about the extent and nature of police undercover operations within left-wing, environmental and animal rights movements continue to surface. After the initial damage control exercise by the police, there is no doubt that these revelations have played well for them as far as discouraging protest has gone. The possibility that your dearest comrade may turn out to be copper recording your every word and using you to get at your genuine friends is undoubtedly offputting for anyone considering getting into radical political action. Certainly, many of the ‘old guard’ of activists most intimate with Kennedy and his colleagues went into early retirement following the revelations, taking out a network of considerable experience that is today sorely missed. Whilst it is nothing particularly new, the relative social and economic privilege of many individuals within radical left circles remains a formidable barrier to solidarity. This was nowhere more apparent than in the aftermath of the 2011 riots, in which the action was conducted largely by members of an underclass far removed from the typical left-wing activist profile. I remember a particular anarchist organisation in the city I lived in at the time calling an urgent meeting to respond to what had happened which, needless to say, none of them had been involved in. It seemed to go very well and a concrete plan for prisoner support and solidarity activities was drawn up. However, it seems that the organisation changed its mind, amongst murmurings over “damage to working class property,” instead deciding that the rioters were not worthy of solidarity after all. In spite of all the anarchist rhetoric about the necessity of fighting the police it seemed that when gangs from the local estate actually got on and did it they were not deemed to be the right kind of protagonists. Had they been a self-styled member of the precariat working at the local indie record shop maybe it would have ended differently. Whilst class privilege is certainly a major issue within many ‘professional’ activist circles, it is not the only one. Issues of race and gender, to name just two that have raised their ugly heads in recent years, are also fault-lines along which the lack of solidarity of the privileged with the unprivileged is visible. For example, a few years back a workshop on white privilege was held at the London Anarchist Bookfair in order to explore how the movement could do better at addressing the hierarchies of race that exist within it. This was loudly dismissed by certain white anarchists (who incidentally didn’t bother attending) who claimed that race privilege could only be found in settler societies and couldn’t be imported to the UK. The voices of non-white members of the milieu were not considered worth listening to. As long as solidarity cannot be extended across barriers of privilege, anti-systemic movements will remain riddled with internal suspicions and of limited effectiveness. Given the increasingly heavy repression of protest, combined with the continued unwillingness of wider society to participate, the disease of cynicism is easy to give in to. It seems as though change is impossible and all attempts at making change happen end up seeming naïve, even laughable. When action is off the cards for one reason or another, the culture within radical circles seems to shift towards a one-upmanship based around who is the most world-weary and nihilistic. After all, pointing out how pointless every new idea is is easier than formulating new strategies and tactics. This climate of cynicism is an individual defence mechanism against the perceived impotence of wider movements but its infectiousness is extremely damaging to future hopes. Of course, there will be times when individuals burn out and lose their interest in causes they were previously passionate about. That is natural. But they should step aside for those periods rather than try to bring down everything around them. Criticism is important as long as it remains constructive and comradely. Individuals who are consistently negative may need to be supported to take some time out to follow other interests, for their own good as well as the good of the groups and movements they are a part of. In order to avoid falling into this trap myself, I feel I should offer a few suggestions of ways forward that might revitalise liberatory movements in the UK. How is it possible to avoid repression and hierarchies of privilege whilst opposing austerity in a sustainable way? I believe that it may be time to return to local communities, away from the big London-centred spectacles that brought about an escalation of ‘total policing’. By adopting a similar model to that of the much admired SeaSol, local groups could engage in solidarity work with a wider range of people than the usual suspects. Taking on corrupt landlords and dodgy businesses or opposing the closure of local amenities would not only start the process of becoming properly rooted in the community but is likely to involve taking on opponents who can be beaten, boosting morale and evading cynicism. It also involves actions that are, broadly speaking, legal and certainly do not lead to mass arrests and the threat of prison sentences. This is hard work and has to be committed to for a long time before producing results, but it seems to me that there are few other options available at this moment in time. This is the kind of activity that could build strong networks of solidarity ready for when the next uprisings occur. This is one idea and I am certain that there are many other better ones out there. This article is hardly intended as a definitive take on the situation – it is merely an attempt to offer some observations on the ongoing conversation amongst activists over how to proceed. All that is important is that we work out what has happened and learn from the past so that the coming insurrections go beyond our current imaginings. Mikhail Goldman is a former domestic extremist from the Midlands. His interests include anarchism, anti-fascism and anti-racism, counter-surveillance, no borders and tea of all varieties. Thanks for your article! I have a few comments, if that’s ok? I absolutely agree with this! But, did you know this is already happening? SolFed has been doing this in the UK for years. In addition, various claimants unions and “solidarity network” groups have been set up in different cities around the UK (for example, check out Bristol Solidarity Network). Some of the anti-cuts groups that survived are now taking on work like this too. I don’t think this is totally true. GBC was formed by people with legal experience from climate actions – and was an important part of the 2010/11 student movement. They have carried on and their legal infrastructure is still supporting campaigners. Bristol Defendant Solidarity is an even better example – they were formed in response to the 2011 riots and to their credit have kept at it and continued to give support to people imprisoned who wanted it. On a grander scale, the Anarchist Action network which opposed the G8 last year is still going. Both the Anarchist Federation and the Solidarity Federation were very active in the anti-austerity movement – they haven’t died! SolFed in particular was very visible at the Sussex University protests last year, which did a lot to inspire the current surge in student struggle. And the UK IWW, though not anarchist, has been growing rapidly over the past few years. So, while I agree with much of your analysis, I do think that there is far more cause for hope than you say! Thanks for your comments. I suppose, to my shame, I’ve never really come across SolFed enough to know whether they would fit with my idea of ‘what needs to be done’. SolFed don’t seem to have a presence in the East Midlands. I mentioned SeaSol because they have a very specific model that seems to be quite successful. I accept your point about GBC although that isn’t really an infrastructure for protest in the same way that the moving tat caravan with all the relevant skills was for anti-roads/anti-summit/Climate Camp. GBC and Bristol Defendant Solidarity are fantastic organisations but very much defensive ones rather than ones that will help us attack. Whilst I hate to be the one to piss on other people’s fires, I think that the other struggles you cite as reasons to be cheerful are maybe more of a case study in why the movement is delusional about its successes. That these are offered as the most hopeful signs of life simply shows the low levels of activity and success that have occurred over the past few years. I’m sure they were important to the people involved and have had a local impact but these are hardly the pinnacles of a confident and effective movement. I think that will take a long time to achieve again and will take a drastic reorientation of our forces. I am working on a sequel to this article in which I hope I can give more ideas. I could not agree more with this article and the comments. But I do think there is a big divide between the people who are suffering the cuts and the activists. What is missing from a lot of organisations, including the Peoples Assembly and Left unity, just to mention two of the most obvious, is a link with working class communities. Why is it that organisations have thrown up writers and celebs as leaders and not the people on the frontline who are really being attacked physically and mentally? That is one of the reasons why there are few working class people in many of these new organisations, you do find them in the anti-cuts and welfare groups that can relate directly to the needs of those people. I think community based organisations are the way forward although I do think there is a real lack of hope around in believing that we can change society. How does the author square these two statements? A couple of times the author laments the disappearance of an “old guard” and their experience. Experience is over-rated, there are a few basics that are worth passing on to newer activists – the value of a ‘no comment’ interview for example but not much more than that. New struggles demand new tactics and new ideas. Experience may come with age but then so does caution- it is difficult as you get older to not become a bit more comfortable, to have more to lose and therefore to be more risk averse. The danger of the existence of an old guard is that this caution becomes institutionalised. The “old guard” are by definition those who have hung around being activists for the longest – they have a lot invested in that identity. Consciously or otherwise they present as ‘experts’ something that if not handled well can actually inhibit the kind of bold action that they are ostensibly calling for. Thanks for sharing – another very useful perspective! I don’t think the lack of hope is anything new and is not accidental but has been deliberately constructed by the capitalist state. The key word is consistently. I think I only mentioned the old guard once but I don’t think it’s possible to simply dismiss the value of experience. I agree with your comments on the negative side of having an ‘old guard’ but I think the confidence that experienced activists demonstrate in dealing with situations can be very useful for new people to witness. Besides, if no one stayed in activism past the age of 30 then surely the urge to go into early retirement would be even greater than it already is. Interesting, though a few bits I didn’t understand (what is ‘the precariat;?). I think the reasons why people are not more active are far more varied and complex than you cover – perhaps inevitably as complex situations can’t all be crammed into one blog post. The reasons certainly include the lack of a credible alternative to fight for – most people think this society is the best they can expect. They may think aspects could be improved but not by politicians or even by politics. We can easily get 50 or 100 thousand signing a petition on a particular issue, but organising, joining, marching…. these are not part of most people’s consciousness. The end of the states led by Communist parties with even a nominal adherence to socialism has had a long-reaching impact as well, leaving the West free of most ideological competition. The trade unions and the labour party are meaningless for most people, myself included, so it’s not even worth opposing them, they are indistinguishable from the problem. The main ideological alternative seems to be jihadist ideologies like that of ‘Islamic State’; perhaps the absence of any strong political domestic movement is one reason why some British citizens leap quickly from fairly normal lives to fighting in Iraq. Climate change and the more general rapid pollution and destruction of the Earth’s air, water and land is a low priority for most people outside of the scientific and conservation community, except for the Greens. To end on a positive note, the huge demonstrations in support of Gaza were encouraging, and we are building an ever stronger movement in solidarity with Palestine. I think you’re right regarding the *perception* of a lack of alternative to neoliberal capitalism. The nonstop propaganda for this ideology and instant rubbishing of anything that dares to question it (just look at how Russell Brand has been treated) is another angle from which we are suppressed. Any successful radical movement will require skillful navigation of the media minefield.